The Tree of Tongues, c. 1930-37 by J.R.R. Tolkien (1892–1973). The Hill: Hobbiton-across-the Water, 1937 by J.R.R. Tolkien (1892–1973). The Shores of Faery, 1915 by J.R.R. Tolkien (1892–1973). A map of Rohan, Gondor and Mordor with plot notes for The Lord of the Rings, Book V, 1944, by J.R.R. Tolkien (1892–1973). Barad-dûr: The Fortress of Sauron, c. 1944 by J.R.R. Tolkien (1892–1973). The Enchanted Wanderer and Other Stories by Nikolai Leskov. English translation by Richard Pevear and Larissa Volokhonsky. First edition hardback from Knopf’s Borzoi imprint. Jacket design by Peter Mendelsund. There are still a few tales in here that I haven’t read, most notably the titular novella. The Silmarillion by J.R.R. Tolkien (and arguably, Christopher Tolkien, whose edits gave the book shape and form). 1983 first American edition trade paperback by Houghton Mifflin. No designer credited, which is a damn shame because I love this book cover. This is maybe the first book I recall buying with my own money. Miruna, A Tale by Bogdan Suceavă. Translated from the Romanian by Alistair Ian Blyth. 2014 trade paperback by Twisted Spoon Press. Cover design by Dan Myer. A strange and remarkable novella set in the Carpathians that moves time and history into fantasy storytelling. The Fellowship of the Ring by J.R.R. Tolkien.Sixty-second printing of a mass market paperback Ballantine Books edition (1977). No designer is credited, but the cover painting, titled, The Hills: Hobbiton-across-the-Water, is by Tolkien. All three books were a gift from my aunt. The Two Towers by J.R.R. Tolkien.Sixtieth printing of a mass market paperback Ballantine Books edition (1978). No designer is credited; cover painting by Tolkien. The Return of the King by J.R.R. Tolkien. Fifty-sixth printing of a mass market paperback Ballantine Books edition (1977). No designer is credited; cover painting by Tolkien. 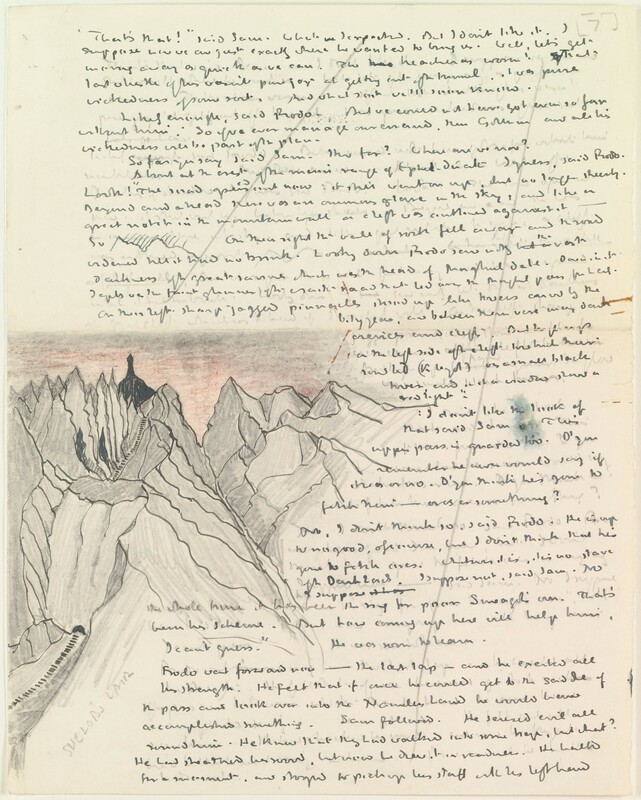 From the forthcoming The Art of the Lord of the Rings, which collects Tolkiens’s preparatory drawings for his epic. Via/more at Wired. [Editorial note: The following citations come from one-star Amazon reviews J.R.R. 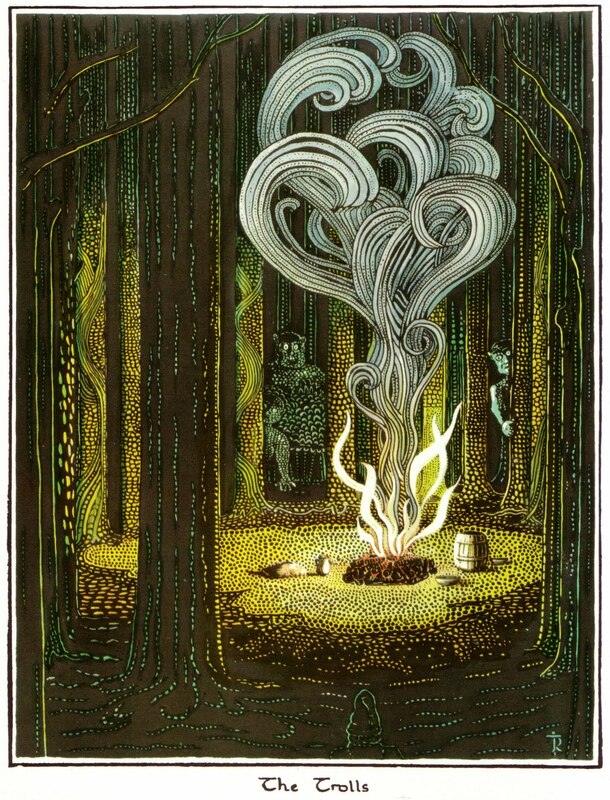 Tolkien’s novel The Hobbit (a book I’ve always loved). I’ve preserved the reviewers’ original punctuation and spelling. More one-star Amazon reviews.]. It is just so boreing. This is such a horrible book. Swoar, lil’ fools wack for REALL. And what’s this thing about hairy feet? Crying because the story will NOT END! Spend your money on Harry Potter instead. I dought we will ever finish this horrible book. I know for a fact that there are several of Hobbit fans. Bilbo is a Hobbit who seems not to do much in the story. it was as if a ten year old coul’ve made up these characters. forget about all the other reviews. they just think bilbo the bimbo is hot. This is a dangerous book and is an extremely bad influence on adolescents. Not only that, it is also more boring than having tea with nan and the relatives. There is no action and Bilbo Baggins is the biggest a$$ in a fantasy novel ever. This is a prime example of what happens when Star Trek and Star Wars dorks pick up a book. No originality whatsoever is involved and the pages make me wish I was not even in existence. After reading literary masterpieces by Robert Jordan, and Aurther C. Clark, books like these seem pointless. One more things on the dwarves. They are useless characters and this story makes me want to vomit. This book is a story of your everyday savior (supposedly Bilbo) having adventures and slaying a dragon. The ending of the story is horrible and it seems that Tolkien wasted his POOR and SENSELESS usage of his brain. They also don’t fit the spirit of dwarves, but then again after time they evolved into the grumpy alchoholics fantasy tends to portray them as. Bilbo is not exactly the character which you would find addicted to. He stammers and is basically a coward. This yogurt tastes awful! This is the worst yogurt I have ever tasted! And like all stories, there are monsters and strange happenings. What was I drinking when I decided to read this piece of junk? I despise and loathe this series tremendously. Bilbo reminds me of a pig. Burroughs’s (surprisingly lucid) early novel Junkie may take its name from heroin, but it’s full of weed smoking. Lesson: weed smoking leads to heroin. And the inevitable search for yage. Doc Sportello, the wonky PI at the off-center of Pynchon’s California noir, is always in the process of lighting another joint, if not burning his fingers on the edges of a roach. A fuzzy mystery with smoky corners. Hal Incandenza, protagonist of Wallace’s opus, spends much of his time hiding in the tunnels of Enfield Tennis Academy, feeding his bizarre marijuana addiction, which is, in many ways, more of an addiction to a secret ritual than to a substance. Hal’s hardly the only character in IJ who likes his Mary Jane; there’s a difficult section near the novel’s beginning that features a minor character preparing to go on a major weed binge. His pre-smoking anxiety works as a challenge to any reader seeking to enter the world of Infinite Jest. I’m pretty sure “pipe-weed” isn’t tobacco. I kind of hated Chronic City, a novel where characters seem to light up joints on every other page. It seems to have been written in an ambling, rambling fog, absent of any sense of immediacy, urgency, or, uh, plot. Bloodless stuff, but, again, very smoky. Okay. Stoner has nothing to do with marijuana. But, hey, it’s called Stoner, right? Carver’s classic story features a myopic narrator who comes up against his own shortcomings when he meets an old friend of his wife, a blind man who ironically sees deeper than he does. After drinking too much booze, they spark up, share a doob, and take in a documentary about European cathedrals. Great stuff.